Biryani sounds very difficult for many. But once you learned the perfect proportion of spices, tenderness of meat and rice and the blending process, for sure you might say that it is the easiest one-pot royal meal ever. Today am going to share a very famous Indian delicacy of Punjabi cuisine - Chicken Tikka Biryani. 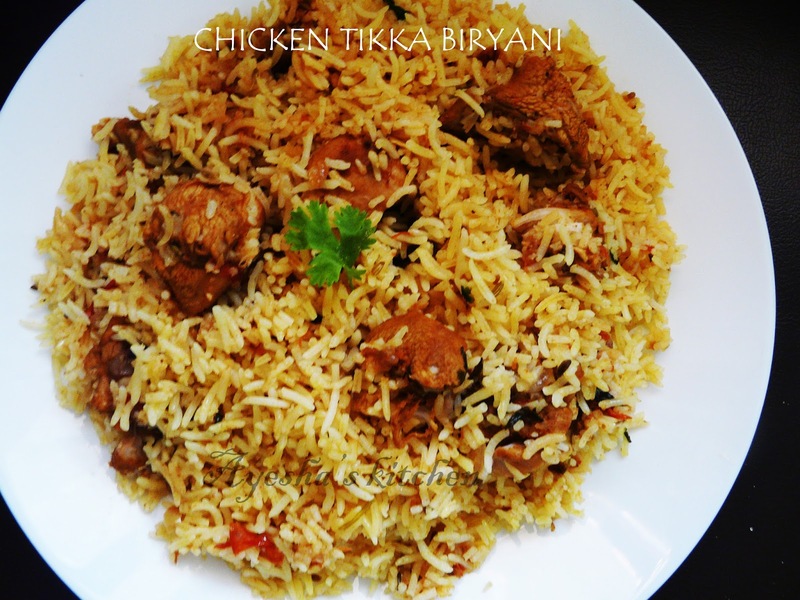 Normally the preparation of tikka biriyani is very lengthy as it involves the grilling process. So I searched google for the recipe without a grill and got easiest and finger-licking recipes. Here, all other processes are same as other varieties of biriyani, except the marination and cooking of chicken. So let's see how to make this aromatic delicious tikka biriyani on the stove top. As the chicken is cooked on stove top, you have to use boneless chicken or medium sized chicken pieces. Make some slits on the chicken for letting the marinade inside well. I used homemade chicken tikka powder and skipped the use of food color ( adding food color will give dark red color to the chicken, but it is unhealthy). The recipe of Homemade tikka powder is given below. Fry the thinly sliced onion till golden, drain excess oil using tissue towel and set aside. Now start marinating the chicken. Make fine slits on the chicken if it is not boneless for letting the marinade inside well. Marinate with curd, cumin powder, chili powder, coriander powder, tikka masala powder, vinegar, green chili, chopped coriander-mint leaves, half of the fried onion and salt. Mix well with hand. Keep it refrigerated for half an hour. Meanwhile, we can prepare the rice. So take a vessel and boil water ( more than double the amount of rice). Put cinnamon, cardamom, cloves, bay leaves. When the water starts boiling, put some curry leaves and add enough salt. Now add the cleaned rice to it. When it starts boiling, add vinegar and 1 tbsp oil to it and close the lid. Cook till the rice is 90 % done. Now drain the water in the rice and keep it aside. Again heat a vessel and add ghee. Add sliced tomato and saute for 2 minutes. Then add the marinated chicken pieces and cook well until the water in the chicken dries out. Make the flame to medium-low. Now drop some boiled rice over the masala, then spread chopped coriander leaves, fried onion and some drops of ghee. Again layer the rice and repeat it. This process is called Dum. Finally garnish with coriander leaves, fried onions and spread some ghee on the top evenly. Close the lid tightly and can keep some weight over the vessel (optional). Or can close all the ends of the vessels with maida dough. Allow it to cook in very low flame for 30 minutes. Dry roast all the spices till a fine aroma comes out. Grind in a blender to a fine powder. You can also add red food color to get a reddish masala powder.